More than fifteen years have gone by since Congress passed the Telephone Consumer Protection Act, or TCPA, in 1991. That law, which is codified as 47 U.S.C. § 227, restricts the use of automated systems for placing telephone calls and sending fax and text messages. https://en.wikipedia.org/wiki/Telephone_Consumer_Protection_Act_of_1991. It was designed to provide relief to consumers, and it has survived several legal challenges from the telemarketing industry, but those pesky text messages, and even faxes, are still coming in at a rapid pace. 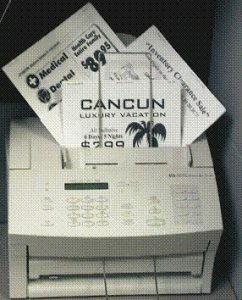 http://blogs.findlaw.com/free_enterprise/2017/03/junk-faxes-still-a-thing-now-causing-federal-lawsuits.html. Why? The answer lies, in large part, in the fact that faxing and texting are such cheap ways to reach large numbers of consumers. It doesn’t help that the federal government has struggled to enforce the TCPA. https://www.gao.gov/new.items/d08125.pdf. Unfortunately, the temptation to stretch an advertising dollar is often great, and that is especially true when the odds of getting into trouble with the feds are low. Worse, advertisers who are interested in mass faxing and mass texting technology find plenty of help and encouragement from businesses known as “broadcasters” or “blasters.” These businesses specialize in sending out junk faxes and junk texts—the irritating communications that gave rise to the TCPA in the first place—yet the law generally does not impose any liability on them and they continue to operate. Instead, it is the advertisers themselves, or the businesses who hire the blasters, who are liable for any violations. Liable to whom, you ask, and how? That’s where you—readers of the Blog and recipients of unwanted faxes and text messages—come in. If you receive a junk fax or junk text, it’s possible that the advertiser who sent it to you violated the TCPA and must pay you statutory damages of $500-$1500 per occurrence. It may be worth your time and effort to send the fax or text to an attorney for assessment. You can reach the attorneys at Cafferty Clobes Meriwether & Sprengel LLP for a free, no-obligation evaluation at 312-782-4880, or caffertyclobes@caffertyclobes.com. Please include a copy of the offending fax or text message and a note indicating the best ways to reach you.